The Nathaniel Russell House Museum has a reputation that has garnered it both regional and national familiarity and significance, and which has earned it a place of honor as one of the most distinctive buildings in Charleston. Serving as the home base for the Historic Charleston Foundation, this notable collection of small hidden offices and gloriously restored 1800s grandeur is a worthy stop on any historical home tour through the streets of Downtown Charleston. At the Nathaniel Russell House Museum, new visitors will quickly find that opulent gardens, gathering spaces and history combine to make this home, and generally speaking this southern city as a whole, one of the most beautiful and stately on the East Coast. 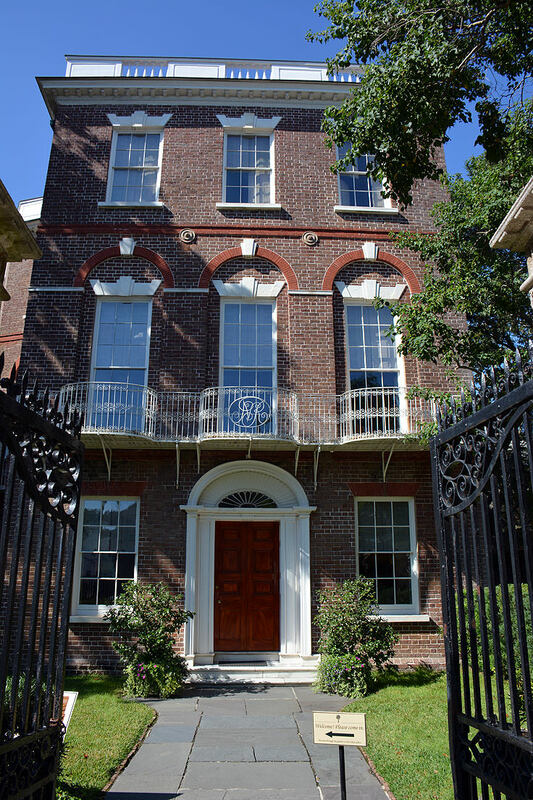 The Nathaniel Russell House is considered in national circles as one of America's first and most important neoclassical dwellings in the country - a distinction that landed the home on the National register of Historic Places in 1973. The house itself, which is located on Meeting Street in the downtown area near High Battery, was constructed, naturally, by Nathaniel Russell who relocated to the southern city from Bristol, Rhode Island in 1765. The timing was perfect, as Charleston was quickly developing a reputation as one of the busiest seaports in the country, with a per capita wealth that was nearly four times the amount of the other 12 American colonies. As a merchant dealing with the shipment of cargo from America to the West Indies, South America, continental Europe, West Africa, and Asia, Russell did very well in his new home, and in 1809, spent $80,000 on the Adamesque building that would eventually share his name. The home would stay with the Russells, which included Nathanial, his wife Sarah, and their two daughters, until 1857, when it was purchased by Governor R.F.W. Allston and his wife. Later on, the house would be transformed into a school for the Sisters of Charity of Our Lady of Mercy, and as a private residence once again before being purchased by the Historical Charleston Society in 1955, and almost immediately thereafter opening for public tours. The interest in the home as a landmark and historical treasure was understandable. The home features a wide array of intricate and grandiose architectural features which are nationally distinctive. An elliptical spiral staircase ascends all three floors, while ornate iron balconies surround the house, never interconnecting. Three significant geometric designs meet on the first level of the home, including a front rectangular room, a center oval room, and a square room in the back, and a first floor oval dining Room and second floor drawing room have been painstakingly restored to their original glory. In 1995, the Historic Charleston Foundation underwent a massive renovation restoring the house while studying its roots and embarking on a decades-wide search for the family's artifacts. The result is a beautifully and authentically appointed home, with turquoise or mustard colored rooms, harps and "fainting couches," and an ambiance of wealth and history that is palatable in every nook and cranny. Outside, the gardens are a special delight for flora and fauna lovers, with perfectly-manicured walking paths and hedges, and bursts of color that change with the season. Springtime visitors will definitely want to pop-in for the massive tulip display, which features dozens if not hundreds of soft pink blooms that stand out again a dark green but lush background. 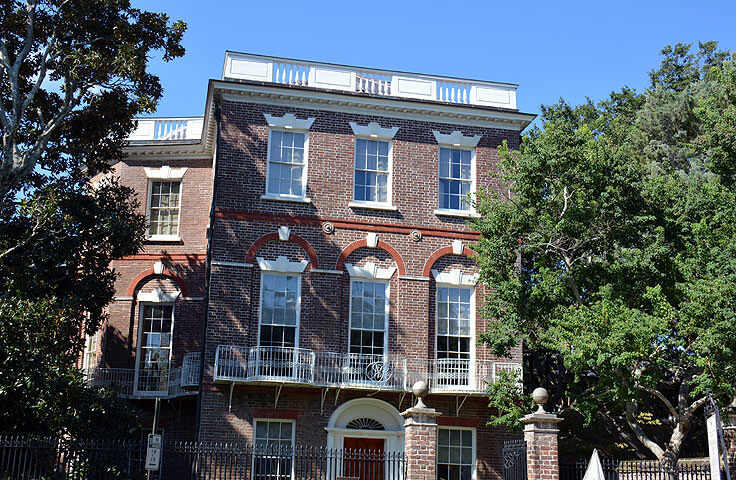 While the offices of the Historic Charleston Foundation are generally out of view, tours of the home are available to the public daily from Monday through Saturday, 10:00 a.m. until 5:00 p.m., and Sunday from 2:00 p.m. until 5:00 p.m. (Visitors should note that the last tour begins at 4:30 p.m.) Tickets are around $10.00 for adults and $5.00 for children ages 6-16, with free admission for kids under the age of 6. There are also special "Children's Discovery Tours," held every Wednesday, where kids can enjoy a wealth of hand-on activities that bring the history of the 1700s and 1800s to life. These special tours last 30-45 minutes, and are followed with historical games and activities in the gardens. Otherwise, during a standard tour, visitors can expect to enjoy an in-depth look into both the home and the city's history, starting with the Russells, and focusing on both the wealthy residents and the enslaved African Americans who were responsible for maintaining one of the country's grandest homes. Exhibitions throughout the house, (particularly in the original kitchen house), sheds light on this these former residents, with pottery shards, beads, and even a part of a slave tag that were all found during a thorough site excavation. In addition to the regular tours, the Nathaniel Russell House Museum also features special programs, held every month or so, that unearths a new component of the home, and the Historic Charleston Foundation's extensive and far-reaching efforts to preserve it. For example, special tours can include a background on the science of finding and collecting pertinent objects, or an extensive tour through the home's decadent silver collection. 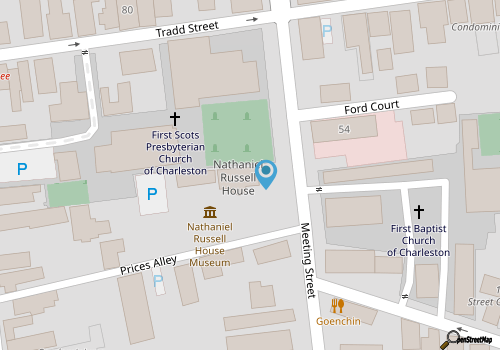 Upcoming events are always listed on the Historic Charleston Foundation's website at https://www.historiccharleston.org/Russell, and potential visitors can purchase tickets online as well to reserve their spot on an upcoming tour. Historic home tours are a common activity on a sunny downtown Charleston day, and whether a tour is masterfully planned or just an impromptu stroll along Meeting Street, Charleston newcomers with a love of history would be remiss to miss the Nathaniel Russell House Museum. This statuesque brick building with ornate balconies and seasonal blooms is an eye-catching local residence that has allured Charleston visitors to pop in and take a look around for generations, and continues to be a fascinating destination for archeological experts and everyday tourists alike. Stunning from the wrought iron gates to the colorful gardens, the Nathaniel Russell House Museum is the flagship home base of the Historical Charleston Foundation, and is certainly worthy of a stop and a photograph or two. As a result, Nathaniel Russell House Museum patrons will enjoy a heady introduction to one of Charleston's most notable, and immensely impressive, historical sites. The Sullivan's Island Lighthouse, also commonly known as "Charleston Light" holds a unique title in Carolina Lighthouse lore as one of the most modern lighthouses in the country. The unique triangular and slim structure, which is broken up into two black and white color blocks, is hard to miss, and is a distinctive local landmark that hovers over the beach scene.